ValTec is a four member Michigan LLC comprised of automotive plastics partners who possess over 100 years of automotive/non-automotive plastic and business experience. ValTec was established in January 2005. The company has grown to employ over 150 people. Located in Imlay City, MI ValTec owns 34+ injection-molding machines ranging from 85T to 1,500T. We also own a large assortment of secondary equipment and are operating in a 156 K sq. ft. fully equipped facility. ValTec is committed to our customer’s needs by offering products and services that always put the customer’s quality, costs and on-time delivery as our priority. We strive to provide every customer with excellent and responsive service by managing with honesty and integrity. 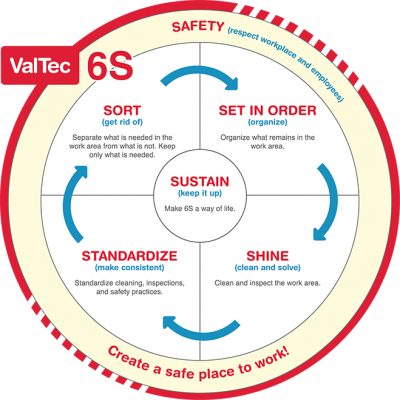 6S is our methodology for safety, organizing, cleaning, developing and sustaining a productive and safe environment. "Quality is a way of life; not just a policy"
Our Employees are dedicated to making ValTec successful by meeting our customer’s expectations while working continuously to provide customers with the best products possible. They are aware of the quality level needed to compete in today’s market and actively participate in Continuous Improvement and Problem Resolution. ValTec’s management team achieves customer satisfaction by using their combined years of automotive and non-automotive experience. Our goal is to continuously improve service, quality and cost to each and every customer. We view our relationship with our customers as a partnership. Through teamwork, we maintain a working environment that produces employee satisfaction and empowerment. A positive work environment generates a more rewarding customer experience. All managers and supervisors are versatile in molding capabilities, product management and coordination and possess technical experience in injection molding of all resin types and part design configurations. Our Maintenance team is experienced in preventive maintenance for injection molds and automated assembly equipment including robotics. They are experienced in all types of repair and maintenance of injection molding machines and secondary equipment. Quality Management and Quality Engineering personnel have proven track records in the development of effective systems and have experience in program launches, problem solving and continuous improvement methods. Examples include Six Sigma, APQP and LEAN manufacturing.